DJ Dream Caravan has just done a big load, in preparation for spinning some tunes at a Fence Records showcase at Glasgow's Oran Mor next weekend, as part of the West End Festival. There's an amazing line-up; Fence, as usual, filling the machine beyond the manufacturer's recommended capacity. Where other labels might spread the load across two washes or more, to prevent potential damage to the machine, they always have to try to squeeze in just one more musical towel. Anyway, it's a biggie, 5pm until midnight, with Randolph's Leap, Kid Canaveral, eagleowl, Pip Dylan, Monoganon and The Pictish Trail all playing. 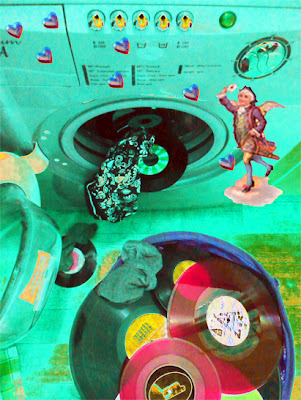 Dream Caravan will be the renegade pink sock let loose in the mix... going to try to play mostly appropriate records, and not turn anyone's sets a lurid shade of flamingo, but... as fellow travellers of the myth-dimensional vinyl spin cycle will know, when the cosmic flamingo awakens, its call can be hard to ignore. There are still tickets left! You can find all the info here, and there's a Facebook event here.